DOT recently replaced a barricade with these signs. Photo by Phil Brown. 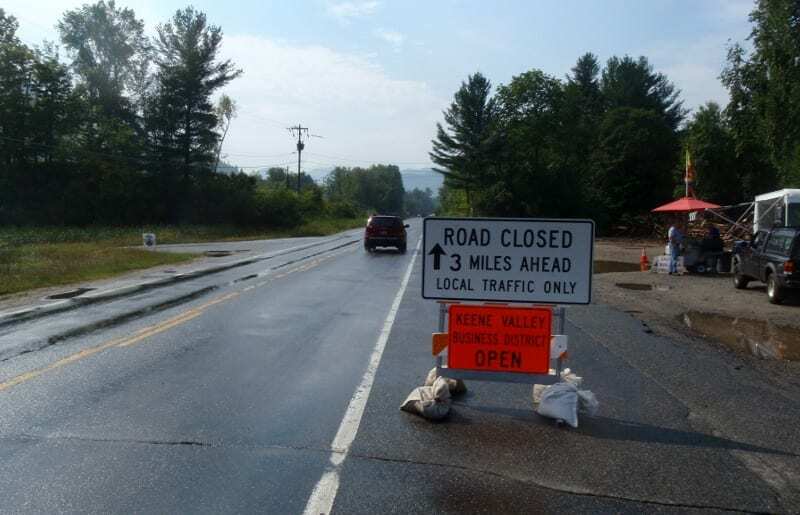 Governor Cuomo came to the Adirondacks on Labor Day and delivered good news for the beleaguered community of Keene Valley: Route 73 will be reopened by September 15. Since Route 73 is the only way in and out of Keene Valley, its closure after Hurricane Irene meant that local stores saw little traffic in what is ordinarily one of the most lucrative weeks of the year. As I reported last week, business owners wanted the state to reopen the highway before Columbus Day weekend in October. Having seen the extent of damage to the road, I was skeptical that this could be done, so I was surprised by Cuomo’s promise. “I told them either wheels will roll or heads will roll,” the governor said on Monday. Carol Breen, a spokeswoman for the state Department of Transportation, said an emergency contractor will work overtime to open one lane by the September 15th deadline. She said both lanes will be open by September 25. “Most likely there still will be work to do [after both lanes open], but there will be traffic going through,” she said. DOT initially barricaded an eleven-mile stretch from the Route 9 junction (south of Keene Valley) to the Route 9N junction (north of the hamlet), essentially cutting off the community. 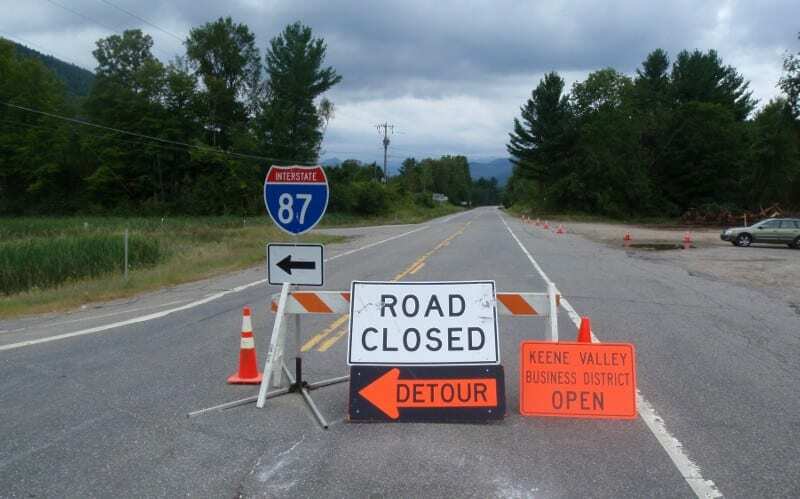 This past weekend the department moved the 9N barricade to allow motorists to drive to Keene Valley. Last week I traveled the entire eleven-mile stretch and found that the bad damage occurred in a half-mile stretch near St. Huberts, where a raging stream undercut the highway, leaving giant craters. North and south of St. Huberts the road sustained minor damage along the shoulders but seemed passable—at least to a layman. What remains uncertain is how much of the road will be restricted to one-lane traffic. Will it be just the half-mile near St. Huberts? Or a longer stretch? “It will depend in part on how much work they can get done in the ten days [before September 15],” Breen said. She added that DOT will open as much of the road to two lanes as possible. Breen expects that DOT will control traffic on the one-lane stretch with temporary stoplights. Marion Jeffers, owner of the Birch Store in Keene Valley, said she was heartened by Cuomo’s announcement and by his mobilization of volunteers and National Guardsmen to help clean up the community. 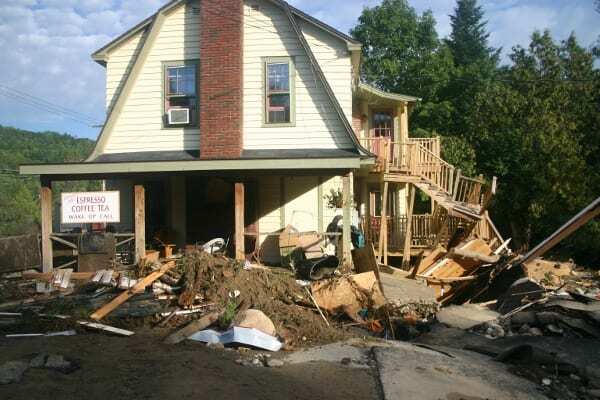 Click here to see more photos and an early post on Route 73.